A familiar face - as well as one not quite as familiar - are hiding in Mortal Kombat, just waiting for players to find them. A leaked list of achievements for the upcoming Mortal Kombat reboot has revealed a pair of unlockable fighters that probably won't appear in the manual. Suffice to say, if you want to avoid spoilers, then you should stop reading around about now. Nestled in among the awards for pulling off a fatality or beating up a few hundred people online, are the achievements "Quan-Tease" and "Cold Fusion." The first is a reward for the unlocking the villainous Quan-Chi, while the second is for unlocking Cyborg Sub-Zero. 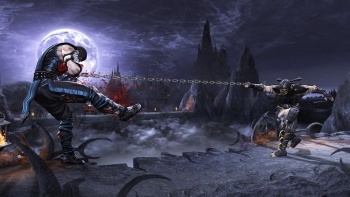 Quan-Chi has appeared in numerous Mortal Kombat games, starting with Mortal Kombat 4. Cyborg Sub-Zero is brand new however, as until now, the icy ninja has remained cybernetics free, much to the chagrin of his former masters. Also included in the secret achievements is an award for performing every character's "hidden finishing move," and another for performing every type of "-ality" in the game, which is to say all the different types of finishing move. The series' trademark "Fatalities" are in, and it's thought that the "Brutality" finishers that first appeared in the SNES/Genesis ports of Ultimate Mortal Kombat 3 are in as well. Other finishing move types in the series have included "Animality," where the fighters turn into animals and finish off their opponents, "Babalities," where the winner transforms the loser into a baby, and "Friendship," where the winner does something friendly, like give the loser a gift. It's currently unknown whether any of these moves will make an appearance in the new game, however.